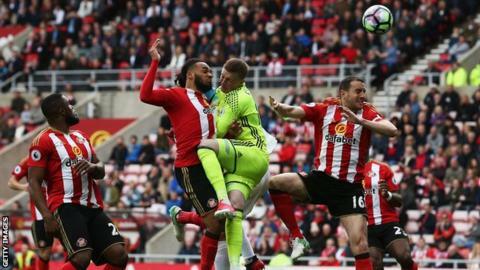 A "disgraceful" Sunderland side need "major surgery" if they are to return to the Premier League, says former England captain Alan Shearer. The Black Cats, who were relegated with four games to go, were beaten 2-0 at home by Swansea on Saturday. Former Newcastle striker Shearer said the hosts' display was "pathetic" and fans should demand a refund. "There is no way that team will get back up into the Premier League," he said on the BBC's Match of the Day. Manager David Moyes has said he will remain in charge despite relegation, but striker Jermain Defoe looks set to leave. Shearer said Moyes and club owner Ellis Short had been "deservedly" criticised this season, but the players - booed off at half-time and full-time against Swansea - should also be blamed. "In the first half they were absolutely disgraceful - there was a complete lack of effort," said Shearer. "It's the last home game of the season, they've been relegated, and you'd think they'd give their fans something to shout about. "It was lazy. There was nothing in their performance at all. "I'm surprised the fans lasted so long - they should be asking for their money back, it was that bad." Sunderland face Arsenal and Chelsea away in their two remaining Premier League fixtures.